In S. cerevisiae the β-1,4-linked N-acetylglucosamine polymer, chitin, is synthesized by a family of 3 specialized but interacting chitin synthases encoded by CHS1, CHS2 and CHS3. Chs2p makes chitin in the primary septum, while Chs3p makes chitin in the lateral cell wall and in the bud neck, and can partially compensate for the lack of Chs2p. Chs3p requires a pathway of Bni4p, Chs4p, Chs5p, Chs6p and Chs7p for its localization and activity. Chs1p is thought to have a septum repair function after cell separation. To further explore interactions in the chitin synthase family and to find processes buffering chitin synthesis, we compiled a genetic interaction network of genes showing synthetic interactions with CHS1, CHS3 and genes involved in Chs3p localization and function and made a phenotypic analysis of their mutants. Using deletion mutants in CHS1, CHS3, CHS4, CHS5, CHS6, CHS7 and BNI4 in a synthetic genetic array analysis we assembled a network of 316 interactions among 163 genes. The interaction network with CHS3, CHS4, CHS5, CHS6, CHS7 or BNI4 forms a dense neighborhood, with many genes functioning in cell wall assembly or polarized secretion. Chitin levels were altered in 54 of the mutants in individually deleted genes, indicating a functional relationship between them and chitin synthesis. 32 of these mutants triggered the chitin stress response, with elevated chitin levels and a dependence on CHS3. A large fraction of the CHS1-interaction set was distinct from that of the CHS3 network, indicating broad roles for Chs1p in buffering both Chs2p function and more global cell wall robustness. Based on their interaction patterns and chitin levels we group interacting mutants into functional categories. Genes interacting with CHS3 are involved in the amelioration of cell wall defects and in septum or bud neck chitin synthesis, and we newly assign a number of genes to these functions. Our genetic analysis of genes not interacting with CHS3 indicate expanded roles for Chs4p, Chs5p and Chs6p in secretory protein trafficking and of Bni4p in bud neck organization. In vegetatively growing cells of Saccharomyces cerevisiae, chitin, a linear polymer of β-1,4-linked N-acetylglucosamine (GlcNAc) residues, is selectively concentrated at the bud neck and is also found as a minor component of the mature lateral cell wall. Chitin is also the main constituent of the primary septum, a structure that separates mother and daughter cells (for reviews, see [1–3]). Polymerization of UDP-GlcNAc to chitin is catalyzed by a family of three membrane-associated chitin synthases (CS) with specialized activities. CSIII, encoded by CHS3, is responsible for synthesis of the chitin ring at the bud neck and for chitin in the lateral wall. CSII synthesizes the chitin of the primary septum, and is encoded by CHS2, a gene that is essential in many strain backgrounds . CSI, encoded by CHS1, is localized to the plasma membrane and to chitosome vesicles  and mutants are hypersensitive to the chitin synthase inhibitor, polyoxyin D, and under acid conditions can form small aberrant buds that are prone to lysis . Disruption of the chitinase gene CTS1 required for cell separation suppresses the chs1 lysis phenotype, leading to the suggestion that Chs1p is involved in chitin repair at cytokinesis . The precise deposition of chitin is achieved through spatial and temporal controls on each chitin synthase which determine their localization and activity. CSII is expressed in a cell cycle-dependent manner, and is transported to the bud neck through the secretory pathway, and subsequently degraded in the vacuole [8, 9]. CSI and III are transported to a specialized endosome-derived compartment, the chitosome, from which they are mobilized by regulated secretion to the plasma membrane [5, 8, 10]. The localization and trafficking of Chs3p require BNI4, CHS4/SKT5, CHS5, CHS6 and CHS7. Chs7p is required for exit of Chs3p from the endoplasmic reticulum , while Chs5p and Chs6p are involved in transport of Chs3p from the chitosome to the plasma membrane [12, 13]. Chs3p forms a complex with Chs4p/Skt5p, a protein required for Chs3p activity during vegetative growth, and Bni4p localizes this complex to the septin ring at the bud neck . Although accounting for only 1–2% of the wild type cell wall under vegetative growth, chitin can contribute up to 20% of the cell wall under the conditions of cell wall stress found in cell wall mutants or on drug exposure . Indeed, in response to cell wall stress Chs3p activity is up-regulated leading to an increased synthesis of chitin, which can be essential for survival. For instance, CHS3 is essential for maintaining the cell integrity of several cell wall mutants, such as fks1 or gas1 [15–17]. Similarly, defective primary septum synthesis can be compensated for by Chs3p-dependent formation of a remedial septum, resulting in a synthetic lethal interaction between CHS2 and CHS3 . To further explore the relationship between chitin synthesis and other pathways, we assemble a network of 316 synthetic interactions of 163 genes with genes involved in the regulation of chitin synthesis. The relationship of these genes with chitin synthesis was analyzed by measuring the chitin content of the 156 viable deletion mutants and by testing for Calcofluor white sensitivity phenotypes of the 116 deletion mutants in non-essential genes of the CSIII network. To identify genes buffering defects in chitin synthesis, we searched for genes engaged in synthetic interactions with BNI4, CHS1, CHS3, CHS4, CHS5, CHS6 or CHS7 using the SGA methodology [18, 19]. 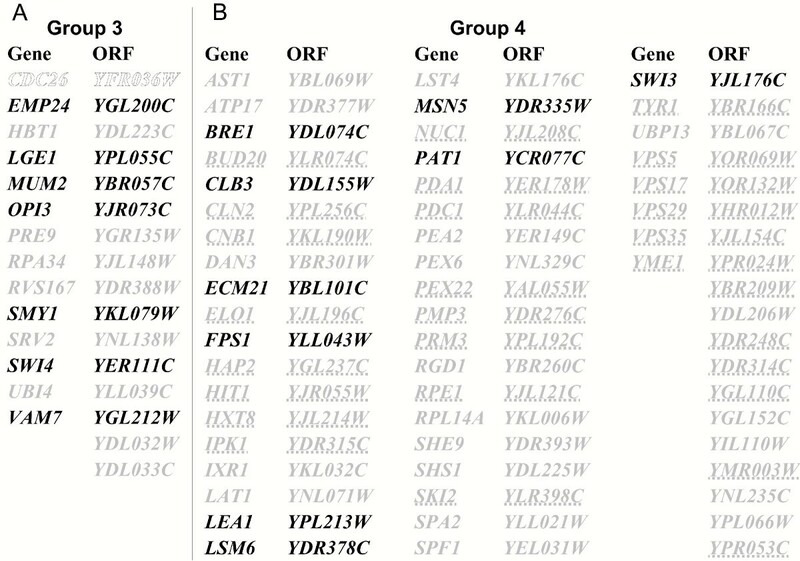 Our results identified 163 genes involved in 316 synthetic interactions that form a network in which BNI4, CHS1, CHS3, CHS4, CHS5, CHS6 and CHS7 are connected to 22, 57, 63, 47, 71, 25 and 31 genes, respectively (Table 2). Genes interacting with BNI4, CHS3, CHS4, CHS5, CHS6 or CHS7 tend to be multiply connected, while those interacting with CHS1 form a more distinct subnetwork (Figure 1A). Indeed, just 17 of the 57 CHS1 interacting genes show an additional interaction with at least another query gene (Figure 1B). In contrast, 67/123 genes interacting with BNI4 or CHS3-7 are multiply connected (Figure 1B, green oval), and 55 of those show an interaction with either BNI4 or CHS3-7 (Figure 1B, red oval) resulting in a densely connected CSIII network. Synthetic interactions with BNI4, CHS1, CHS3, CHS4, CHS5, CHS6 and CHS7. 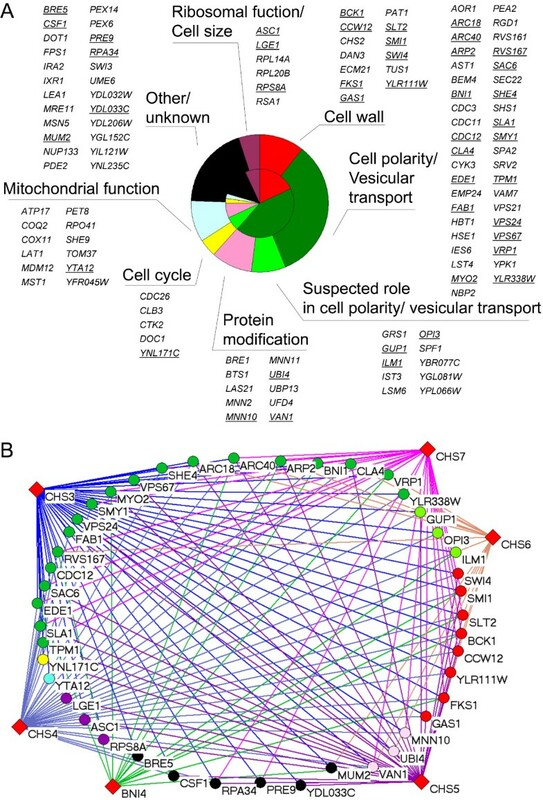 A network of genetic interactions with BNI4 , CHS1 , CHS3 , CHS4 , CHS5 , CHS6 and CHS7. (A) Global view of the network. Synthetic interactions with any query gene (diamonds) are depicted as edges joining these to nodes (circles). Nodes whose deletion mutant have a decreased, wild type and increased chitin content are colored in green, gray and red, respectively. For the decreased (green) and increased (red) chitin contents, color intensity is proportional to the magnitude of the change. (B) Venn diagram of the CHS1 interaction set with the CSIII network. The number of genes interacting with CHS1 or with any of the CSIII query genes is indicated. The numbers in parentheses indicate the number of interactions for multiply connected genes. Genes showing 2 or more interactions are grouped in green or red ovals, respectively. The 123 genes engaged in the 259 interactions of the CSIII network were grouped by function (Figure 2A, outer pie). Some genes show multiple connections, with 55 of these accounting for almost 75% of the interactions. 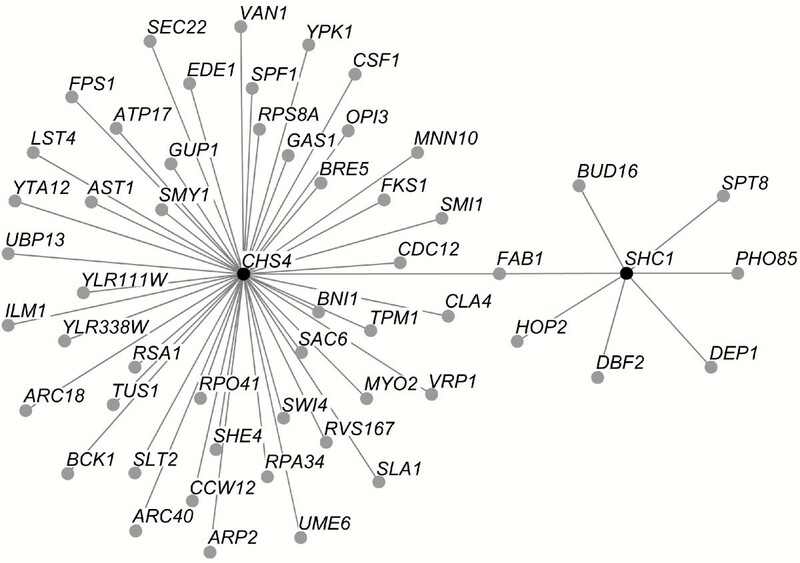 Among this group, 44 genes (Figure 2B) interact with CHS3 and at least one other query gene, reflecting the central role of CHS3 in the network. These 44 genes, involved in 166 interactions, are significantly more connected to the query genes than the remaining 11 multiply connected genes, which have 25 interactions (p < 0.01). Thus, this set of 44 genes defines a core group of multiply interacting genes. In addition, the "core" genes account for 57 of 74 synthetic lethal interactions of the CSIII network , highlighting their importance for survival when the CSIII pathway is defective. Grouping "core" genes by functional categories (Figure 2A, inner pie) revealed enrichment for certain functions relative to the overall CSIII network. For example, cell wall assembly and secretory pathway polarization/vesicular transport contain 18% and 43% of "core" genes, respectively, whereas these functional categories represent 10% and 33% of genes in the CSIII network, respectively. In contrast, the category "mitochondrial function" is under-represented in the "core" group when compared to the CSIII network (Figure 2A). Thus, analysis of the "core" of highly connected genes indicates that cell wall assembly and polarization of the secretory apparatus are central processes buffering defects in the CSIII pathway. Analysis of the CSIII network. (A) Grouping genes of the CSIII network in functional categories. Genes belonging to the "core" group (CHS3 plus at least one other) are underlined. The proportions of the functional categories in the CSIII network and in the "core" group are represented in the outer and the inner pies, respectively. (B) Interactions among the "core" group. Color coding for nodes is as in (A). 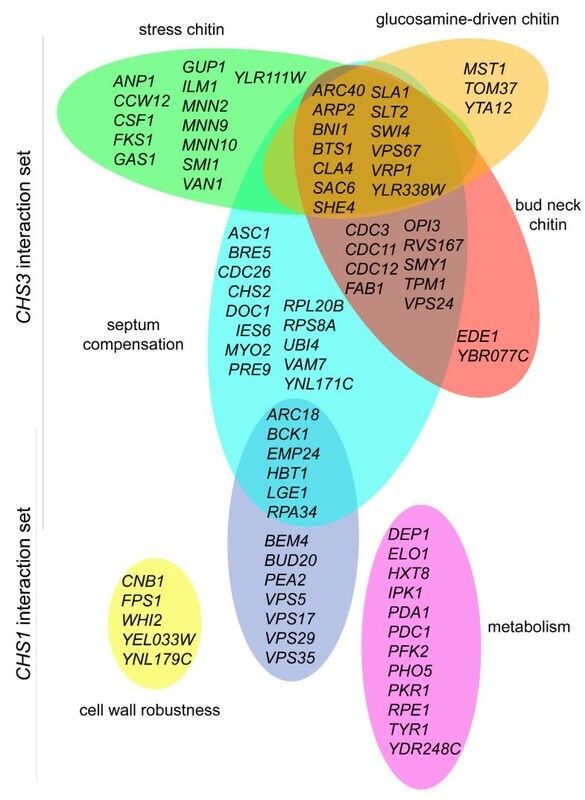 Some 57 genes show synthetic interactions with CHS1 (Figure 1A and Table 2), and while a number of these are embedded in the CSIII network, most interact only with CHS1, indicative of a distinct functional role for Chs1p that is analyzed further in the Discussion. To investigate the relationship between the interacting genes and chitin synthesis, the chitin content of the 156 deletion mutants in non-essential genes of the CSIII network and the CHS1 interacting genes was measured (see Additional file 2). To focus on the biologically meaningful changes in chitin level, a set of mutants with marginally altered chitin content were excluded from our analysis despite their having statistical significance. 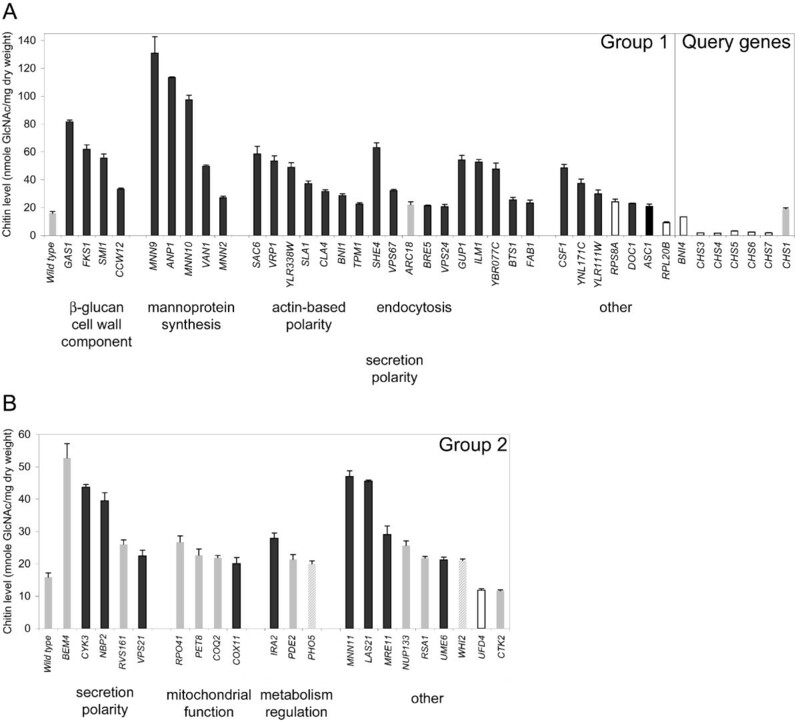 Thus, 51 and 3 mutants with levels above 20 and below 12 nmole GlcNAc/mg dry weight, respectively are discussed below as having altered chitin content. To integrate synthetic interaction and chitin determination data, each node of the interaction network was colored according to the chitin level of its deletion mutant (Figure 1A). Four groups of genes emerged from this analysis. Group 1 has 33 mutants with an altered chitin level and a requirement for Chs3p function for optimal growth (Figure 3A). All but one of the group 1 mutants have elevated chitin levels, indicating that they trigger the chitin stress response. Nine of these genes are involved in the synthesis of cell wall components such as β-glucan and mannoprotein. Half of the group 1 genes (17/33) are required for polarization of the actin cytoskeleton or have a function in vesicular transport through retrograde transport in the endosomal pathway. The majority of the group 1 genes belong to the CSIII network "core", with just 7 genes interacting uniquely with CHS3 (ANP1, BTS1, DOC1, MNN2, MNN9, RPL20B and YBR077C). Thus, the deletion mutants of group 1 genes are highly sensitive to CSIII pathway perturbation. Grouping deletion mutants with an altered chitin content according to their interaction pattern. (A) Chitin levels, expressed in nmole GlcNAc/mg dry weight, in wild type, group 1 and query mutants. (B) Chitin levels in wild type and group 2 mutants. Note the different scales in (A) and (B). Hypersensitivity, resistance, wild type and not determined sensitivity to Calcofluor are indicated by black, open, gray and hatched bars, respectively. Group 2 is composed of 19 and 2 mutants with an increased and a decreased chitin level, respectively, but whose optimal growth does not require CHS3 (Figure 3B). A large fraction of group 2 genes (16/21, 76%) interact with CHS5 and/or CHS6 (Table 2). Group 2 mutants are affected in secretion or mitochondrial functions and in the regulation of transcription and translation. The elevated synthesis of chitin in 19 of the group 2 mutants is probably triggered as a non-specific stress response to the mutation, but unlike group 1, it does not serve to buffer against the deleterious effects of the mutation. For example, a set of 14 group 2 mutants interacting with CHS5 or CHS6 have elevated chitin levels. In these cases, the stress activated chitin response reflects a broader Chs5p- and/or Chs6p-dependent activation that is required for cell wall buffering in these mutants (see Discussion). The third group of 16 mutants have a wild type chitin content and a synthetic interaction with CHS3 (Figure 4A). These mutants are defective in ubiquitin processing/cell cycle progression, membrane biogenesis and polarized secretion. Grouping deletion mutants with wild type chitin content according to their interaction pattern. (A) and (B) group 3 and 4 mutants, respectively. Hypersensitivity, resistance, wild type and not determined sensitivity to Calcofluor are indicated by bold, open, gray and underlined characters, respectively. Finally, group 4 contains deletion mutants in 57 genes with a wild type chitin level and a synthetic interaction with any CHS gene other than CHS3 (Figure 4B). Sixteen of these genes are connected to CHS5, suggesting a broad, and Chs3p-independent, role for Chs5p in their buffering. Calcofluor white is a toxic compound which binds primarily to chitin in yeast, and mutants with cell surface defects frequently show altered sensitivity to it [20–23]. For example, a chs3 null mutant and mutants with a defective CSIII pathway show Calcofluor resistance because they make low levels of cell wall chitin . We thus searched for synergistic interactions between Calcofluor white and the deletion of each gene found in the CSIII network. Mutant strains were spotted on solid medium containing 10 μg/ml or 50 μg/ml Calcofluor white, and scored for sensitivity relative to the wild type. In all, 59% of mutants exhibited an altered Calcofluor sensitivity, with 65 and 4 mutants showing hypersensitivity and resistance, respectively (Figure 3 and 4, and see Additional file 2). As seen in Figure 3, a high fraction of mutants with an altered chitin content also showed an altered sensitivity to Calcofluor. Indeed, 80% (39/49) and 67% (2/3) of mutants with increased and decreased chitin levels, respectively, were hypersensitive and resistant to Calcofluor, respectively. More specifically, 97% of group 1 mutants had a Calcofluor phenotype, revealing the critical role of Chs3p-synthesized chitin in Calcofluor sensitivity. However, Calcofluor toxicity does not correlate strictly with the chitin level or the requirement for Chs3p function. Indeed, 10 mutants with wild type Calcofluor sensitivity have an altered chitin content (Figure 3, gray bars). This set is almost entirely composed of group 2 mutants (Figure 3B), with the optimal growth of 9 of these mutants not requiring CHS3. In addition, 17 mutants with an altered Calcofluor sensitivity have a wild type chitin level (Figure 4, bold and open characters): 8 and 9 of those mutants fall in groups 3 and 4, respectively. The 8 group 3 mutants require Chs3p function but do not trigger the chitin stress response, indicative of a requirement for an additional Chs3p function distinct from lateral wall chitin synthesis, such as remedial septum or bud neck chitin synthesis (see Discussion). The 9 group 4 mutants require integrity of the CSIII pathway but not an increase of chitin level through Chs3p. This subgroup indicates that components of the CSIII pathway function in other cellular processes. Finally, a set of 26 mutants are wild type for both Calcofluor sensitivity and chitin level. Nineteen of them are not connected to CHS3, reflecting chitin-independent functional requirements for CHS4, CHS5, CHS6, CHS7 and BNI4. The SHC1 gene product is 43% identical to Chs4p. While Chs4p functions in Chs3p activation during vegetative growth, the known role of Shc1p is restricted to sporulation . However, overexpression of Shc1p during vegetative growth can compensate for the lack of Chs4p, and reciprocally, overexpression of Chs4p during sporulation partially complements the shc1 Δ mutant phenotype . Although Chs4p and Shc1p show structural and functional relatedness they are not an essential redundant pair since the chs4 shc1 double mutant has no synthetic growth defect. We searched for genes required for the optimal vegetative growth of the shc1 Δ mutant and found 6 synthetic interactions. In addition, we added the previously reported synthetic interaction between PHO85 and SHC1  to this list. FAB1 and DEP1 are part of the CSIII network and CHS1-interacting set, respectively. The remaining 5 genes (BUD16, DBF2, HOP2, PHO85 and SPT8) interact uniquely with SHC1. The pho85 null mutant was not further analyzed due to its very poor growth. The amount of chitin produced in the 4 remaining mutants was measured and found to be similar to the wild type (see Additional file 2). Genes compensating for a SHC1 deletion form a distinct group from those buffering a CHS4 deletion (Figure 5), and their genetic interactions with SHC1 appear to be independent of a chitin defect. Thus, our synthetic interaction data indicate that SHC1 has evolved new functions that are not shared with CHS4 and which extend the role of Shc1p beyond sporulation to mitotic growth. Comparative synthetic interaction patterns of CHS4 and SHC1 . Synthetic interactions with CHS4 or SHC1 are depicted as connections between these nodes and their respective partners (black and gray nodes, respectively). We globally analyzed a network of 259 interactions among 123 genes required for optimal growth of BNI4, CHS3, CHS4, CHS5, CHS6 or CHS7 deletion mutants. The query genes are highly interconnected, reflecting common requirements in the bni4 and chs3-7 null mutants. This network centers on CHS3 function, with CHS3 sharing most of its interactions with the other query genes. The genetic interactions observed with CHS3 can be sorted by Chs3p function, which includes synthesis of chitin in the lateral wall, in the remedial septum and at the bud neck. The Chs3p-dependent synthesis of wall chitin is dramatically stimulated upon cell wall stress, through a stress response pathway involving activation of the chitosome and stimulation of the cell integrity pathway [10, 15–17]. Mutants with cell wall defects activate this stress pathway and our synthetic analysis indicates that many of them require Chs3p function (Figure 6). Our work indicates that the extent of this stress response is far greater than previously realized: just 6 of the 26 mutants in this group were previously known to have an altered chitin content. Among such new mutants involved in triggering the chitin stress response are the cell wall protein encoding gene CCW12, and the actin-based polarity genes BNI1, CLA4, SAC6, SHE4, SLA1 and VRP1. Actin patches are crucial for the proper targeting of cell wall synthesis components , and their perturbation activates a chitin stress response. Other mutants include CSF1, GUP1 and ILM1 that have growth defects on non-fermentable carbon sources and the putative vacuolar protein encoding YBR077C. Functional integration of CHS1 - and CHS3 -interaction sets. CHS1- and CHS3-interacting genes were grouped according to their effects on chitin synthesis. The Venn diagram shows the distinct and overlapping sets for each functional category. Chs3p has an additional role in the synthesis of chitin upon glucosamine addition . The basis for this process is uncertain, but probably relies on metabolic flux changes and appears to be independent of the classic chitin stress response . Deletion of genes compensating for defects in this glucosamine-response pathway may interact synthetically with CHS3 and genes of the CSIII pathway (Figure 6). Candidate genes are MST1, TOM37 and YTA12, involved in mitochondrial function, a process known to be down-regulated by glucosamine exposure: their deletion may lead to metabolic imbalance compensated for by an increased chitin synthesis. Chs2p is responsible for synthesis of the primary septum but a detailed understanding of how this is achieved remains incomplete. Analysis of CHS3 synthetic interactions can give insight into Chs2p function as, in its absence, Chs3p can partially compensate by forming a "remedial septum" . We reasoned that a set of synthetic interactions with CHS3 could occur through perturbation of CHS2 function, leading to the need for CHS3. A group of genes affecting cell cycle progression likely have an impact on septation in this way. For example, mutants in CDC26, DOC1 or YNL171C (which is an apc1 allele) show a delay in exit from mitosis and mutants in ASC1, IES6, LGE1, RPL20B, RPS8A or VAM7 exhibit altered cell size, a phenotype frequently reflecting defects in cell-cycle checkpoints [29, 30]. Deletion of any of these genes can uncouple cell-cycle progression and septation, resulting in defective synthesis of the primary septum by Chs2p. The synthetic interactions between these genes and CHS3 likely result from a failure to fully synthesize both the primary septum (as a consequence of a defect in cell-cycle progression) and a remedial septum (Figure 6). Pertinently and consistent with our data, Ufano et al. show that deletion of SWM1, encoding a subunit of the anaphase promoting complex, also leads to an increase of Chs3p-catalyzed chitin deposition. Chs2p has a cryptic in vitro activity that can be detected only after treatment of a cell extract with trypsin. This suggests that Chs2p may also be produced as a zymogen in vivo and be activated by posttranslational modification . Although proteomic analysis reveals the existence of ubiquitinated and phosphorylated forms of Chs2p [33, 34], the effect of these modifications on Chs2p activity is unknown. Mutants with defects in Chs2p activation or turnover may exhibit a low Chs2p activity and depend on a compensatory Chs3p activity. Of the CHS3 interacting genes, the serine/threonine protein kinases Bck1p and Slt2p are candidates for Chs2p activation, while the polyubiquitin gene UBI4, the ubiquitin protease Bre5p and the proteasome subunit Pre9p may be required for Chs2p turnover (Figure 6). Chs3p synthesizes a chitin ring that marks the incipient bud site. Defects in secretion or polarization of the secretory apparatus may lead to abnormal bud neck assembly and/or septation. For example, the genes EDE1, EMP24, FAB1, HBT1, OPI3, RVS167, SMY1, TPM1, VPS24, VPS67 or YBR077C are required for polarization of the secretory pathway, indicating that transport and proper localization of protein(s) to the bud neck are essential for growth of mutants with low CSIII activity. Thus, we identify these genes as candidates for involvement in Chs2p localization and in bud neck integrity (Figure 6). The existence of synthetic interactions with BNI4, CHS4, CHS5 or CHS6 not shared with CHS3 uncovers functions of these genes that are unrelated to Chs3p transport or activity. Five genes interact uniquely with BNI4, indicating that Bni4p has functions distinct from anchoring Chs3p to the septin ring. Among these, NBP2, RGD1, SHS1 and SPA2 are required for regulation of cytoskeleton organization at the bud neck by the cell integrity pathway. Further, BNI4 shows a unique interaction with YPL066W, which together with the bud neck localization of Ypl066p  implicates this gene in bud development. Our data and the finding that localization of Crh2p at the bud neck requires Bni4p  indicate that Bni4p has a broad role in bud neck organization. Of the 7 unique CHS4 interacting genes, 4 are required for trafficking of membrane proteins. Ast1p and Lst4p are required for Golgi to plasma membrane transport of the H+-ATPase Pma1p and the amino-acid permease Gap1p, respectively [37, 38]. Spf1p, a putative calcium pump of the endoplasmic reticulum, may also play a role in the translocation of transmembrane proteins . Ypk1p, a serine/threonine protein kinase required for full induction of the PKC1-SLT2 cell integrity pathway under stress condition, is also required for endocytosis . Absence of these genes combined with a CHS4 deletion likely leads to defects in targeting membrane proteins to the septin ring, with resultant synthetic growth phenotypes. Chs5p and Chs6p are late-Golgi localized proteins involved in targeting Chs3p to sites of polarized growth  and to the plasma membrane . Our results for CHS5 and CHS6, showing a strong web of synthetic interactions with CSIII network "core" genes, reflect these roles. Whereas little is known about a Chs6p function besides Chs3p trafficking, Chs5p is also involved in the selective polarization of other surface proteins, such as Fus1p  and, at least partially, Crh2p . CHS5 and CHS6 show a large number of CHS3-independent interactions (39/71 and 9/25, respectively), suggesting multiple additional roles for Chs5p and Chs6p in protein targeting. Interestingly, a number of these interacting mutants have elevated chitin levels and fall into group 2. For example, the mutants ira2 and pde2 are synthetic with CHS5 and CHS6 and CHS5, respectively and make 76% and 35% more chitin than the wild type, respectively (Figure 3B). These mutants constitutively elevate the Ras/cAMP pathway and pde2 mutants are known to affect cell wall integrity and to cause slight changes in glucan and chitin levels [42, 43]. Our work suggests that the chitin elevation involves increased activity of the Chs5p and Chs6p chitosome pathway. However, the key buffering component in this cAMP response is not chitin, but must be some other component of the activated chitosome pathway, since neither ira2 nor pde2 show a synthetic interaction with CHS3. Thus here, the stress activated chitin response is a gratuitous consequence of a broader Chs5p- and/or Chs6p-dependent activation that is required for cell wall buffering in these mutants. Regarding the known role of Chs5p in specialized late-Golgi trafficking; several of the CHS5-interacting genes have products that likely work in conjunction or in parallel with Chs5p. These include AOR1, BEM4, HSE1, LSM6, PEA2, RVS161, SEC22 and VPS21. A new candidate is YGL081W that interacts with CHS5, and whose product has been found in a complex containing Cop1p, required for Golgi retrograde transport . CHS5 interacts uniquely with 6 genes involved in mitochondrial function (COQ2, COX11, LAT1, MDM12, PET8 and SHE9) some of which show elevated chitin levels. These mitochondrial proteins may play indirect roles in late-Golgi trafficking; for example, the secretory apparatus and mitochondria exchange lipids , and a defect in mitochondrial function may impact on secretory function. Alternatively, in the absence of CHS5, mitochondria may be poorly transferred to daughter cell with their efficient functioning being essential for optimal growth. Finally, some 9 genes show an interaction with both CHS5 and CHS1 (Figure 1A), indicating some common requirement for these genes. One provocative possibility for this interactional signature is that Chs5p is involved in the targeting of Chs1p. Although it was the first fungal chitin gene identified, the role of Chs1p has remained unclear. Cell lysis phenotypes of chs1 mutants have led to the view that Chs1p is an "auxiliary" enzyme implicated in the repair of chitinase-mediated cell wall damage associated with cell separation . How such damage is sensed or how the repair process is activated remains unclear. The line between repair and redundant synthesis with Chs2p may be an arbitrary one, and a direct role for Chs1p involvement in septal chitin synthesis on growth in acidic minimal media where cell lysis is more pronounced, also explains the phenotype (see  for a discussion). The lysis phenotypes associated with CHS1 deletion also show strain variability. For example, a strain with a recessive suppressor in an uncharacterized gene SCS1 shows no lysis phenotype, indicating the involvement of other genes . Our synthetic approach allows a broad survey of possible CHS1 function. However, CHS1 is part of a family and a synthetic analysis of a gene family can be complicated . Specialized roles for CHS1, CHS2 and CHS3 are likely ancient, predating the genome duplication of S. cerevisiae [48, 49], since all three genes are present in Ashbya gossypii, a related fungus that did not undergo the S. cerevisiae duplication event. 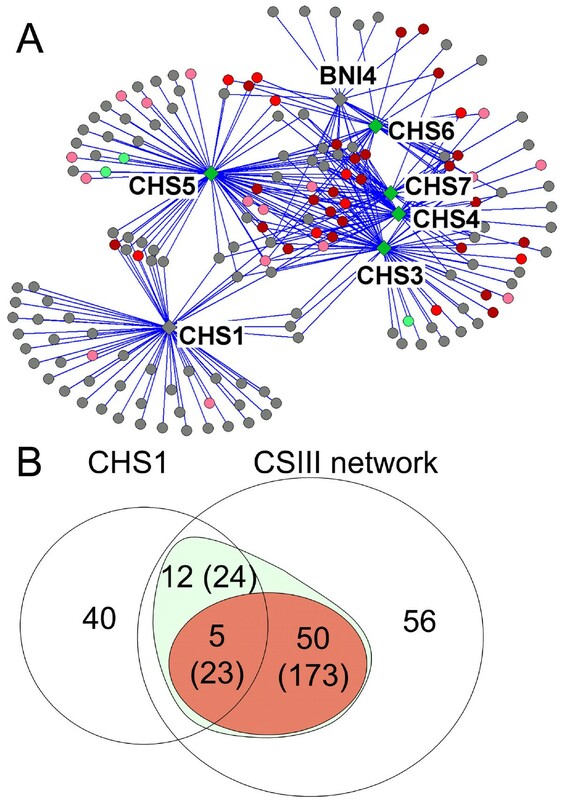 Our finding that the majority of the CHS1 interactions are both distinct from the CSIII network and do not trigger the chitin stress response (Figure 1A) indicates distinct function. CHS1 and CHS3 mutants do not synthetically interact under our test conditions, so the synthetic effects of CHS1 mutants are not caused by a buffering of CHS3 function. Consistent with this, the CHS1 deletion does not activate the chitin stress response, as chitin levels in the chs1 Δ mutant are close to wild type , see Figure 3A). One possible cause of synthetic effects of CHS1 mutants is through genes that buffer Chs2p function. A number of unique interactors with CHS1 are involved in bud morphogenesis (BEM4, BUD20, PEA2), and in protein recycling through the endocytic pathway (VPS5, VPS17, VPS29 and VPS35), all could be required for Chs2p function (Figure 6). This hypothesis, supported by the genetic evidence presented here, will require further testing. In our data we also find interactions with mutants in a number of genes that are singly prone to lysis or show phenotypes consistent with osmotic imbalance (ARC18, BCK1, CNB1, FPS1, and WHI2). CHS1 also shows synthetic interactions with YEL033W and YNL179C, that overlap with and are alleles of YEL034W/HYP2 and YNL180C/RHO5, genes that play a role in balancing cell integrity [50, 51], and with YOR322C which has a role in signaling through the cell integrity pathway . In addition the absence of Chs1p is buffered by the presence of 16 genes (BCK1, BEM4, CNB1, ECM21, FPS1, GRS1, HBT1, HIT1, NUC1, PDA1, PFK2, SPF1, TYR1, YGL081C, YGL110C and YPL261C) that show synthetic interactions with the FKS1, GAS1 or SMI1 genes involved in β-1, 3-glucan synthesis . These results provide strong independent support for a function of Chs1p in buffering cell wall robustness through regulated chitin synthesis, and identify many candidates that may participate in the modulation of Chs2p function. As mentioned above, yeast cells are more dependent on Chs1p to prevent lysis and allow growth on synthetic minimal media [6, 53]. The basis for this increased dependence is unknown, though there are data indicating that the partitioning of Chs1p activity between the plasma membrane and the chitosome is somewhat more pronounced toward the plasma membrane in minimal medium . Interestingly, a number of unique CHS1 interactors are involved in metabolism and nutrient utilization (Figure 6), providing functional clues to this aspect of Chs1p function. Our synthetic network analysis reveals a deep interactional complexity underlying chitin biology. The CHS3-core network is informative in identifying components involved in all aspects of regulated chitin deposition. The chitin stress response that adds chitin to lateral cell walls is now shown to be triggered very broadly by cell wall and actin-based polarity defects and to play a key role in cell wall buffering. The CHS3 core-network also offers insight into Chs2p function by identifying proteins implicated in bud neck localization, and in the cell cycle coordination of septum formation with mitotic exit. Genes involved in secretory trafficking of Chs3p (CHS4, CHS5, CHS6 and BNI4) show many CHS3-independent interactions and these greatly expand the range of trafficking functions for these genes, especially for the heavily interacting CHS5. In contrast to its currently assigned minor auxiliary role, CHS1 shows an extensive web of genetic interactions, most of which are distinct from the CSIII network and which do not trigger the chitin stress response. One set of these identifies components of endocytosis, budding and cell morphology, which may be required for Chs2p function. A second set of 25 interacting genes show that Chs1p is intimately involved in buffering yeast cell wall robustness during vegetative growth. Haploid deletion mutants (Table 1) are available from the deletion project consortium. These strains were arrayed on sixteen 768-format plates using a colony picker . Starting strains for the SGA analysis (Table 1) were constructed as described in Tong et al. . Arrays were propagated at 30°C on standard YEPD (10 g/l yeast extract, 20 g/l bacto-peptone, 20 g/l glucose) or YEPD supplemented with 200 μg/ml G-418 (Invitrogen, Carlsbad, CA). When required, strains were grown on standard SD medium (6.7 g/l yeast nitrogen base, 20 g/l glucose) supplemented with appropriate amino acids . Nourseothricin (ClonNat) was purchased from Werner Bioagent (Jena, Germany). Synthetic genetic array analysis (SGA) was used to identify genes required for the optimal growth of strains deleted for BNI4, CHS1, CHS3-7 or SHC1, as described [18, 19]. From three SGA screens for each "query" gene, ~1,800 potential interactions were identified and 333 synthetic interactions confirmed by random spore or tetrad analysis as described previously . Briefly, spores were germinated into liquid haploid selection medium [SD-His/Arg + canavanine] in a 96-well format. The germinated MATa spore progeny were serially diluted in sterile water and 2 μl for each dilution was spotted onto medium selecting for the query-gene mutation [SD-His/Arg + canavanine/Nourseothricin], the interacting gene mutation [SD-His/Arg + canavanine/G-418], and both the query-gene and interacting gene mutations [SD-His/Arg + canavanine/Nourseothricin/G-418] then incubated at 30°C for ~2 days. Cell growth under the three conditions was compared and double mutants were scored as synthetic sick (SS), synthetic lethal (SL) or no interaction (No) . For tetrad analysis, dissections were performed on solid complete SD medium and growth of individual spores was scored after 4 days incubation at 30°C. Plates were then replicated on YEPD + G-418 or Nourseothricin to identify tetrad type. Growth of double mutants was compared to that of single mutants from tetratype tetrads and then scored as "SS", "SL "or "No". Ten of the 22 previously reported synthetic lethal interactions with CHS3-7 or SHC1 [4, 15, 25, 56, 57] were found by the SGA procedure. Of the remaining, 9 engaged genes whose mutant is absent from our deletion collection (CDC3,CDC11, CDC12 and CHS2) or genes whose deletion leads to systematic growth defects in our conditions (ANP1, MNN9, PHO85 and SRV2) and these genes were used in our network analysis. No synthetic interaction between GAS1 and CHS4 or CHS7 was found by the SGA. These discrepancies with other's data  reflect differences in strain background. These two synthetic interactions were included in our analysis. An additional set of 57 interactions were analyzed further by random spore or tetrad analysis . Of these, 30 synthetic interactions were confirmed, with the 27 remainder discarded (see Additional file 1). It is important to note that this additional set of tested interactions was not random and was strongly biased toward dubious interactions: for example, a group of 11 interactions with genes closely linked to CHS1 or a set of 16 non-reciprocal interactions (that is gene A found in screen for genes interacting with gene B and gene B not found in the set of genes interacting with gene A). Stationary phase cultures were diluted 1:100 into 3 ml of YEPD and grown again for 22-24 h at 30°C. Cells from 1.5 ml culture were colleted by centrifugation (20,000 × g, 2 min). Pellets were then frozen at -20°C until used for alkali-extraction. Dry weights were determined after a 2 day incubation at 37°C. Cell pellets were resuspended in 1 ml 6% KOH and heated at 80°C for 90 min with occasional mixing. Alkaline insoluble material was pelletted (20,000 × g, 20 min), neutralized with phosphate-buffered saline for 10–20 min with occasional mixing. After centrifugation (20,000 × g, 20 min), 200 μl of McIlvaine's Buffer (0.2 M Na2HPO4/0.1 M citric acid, pH 6.0) was added to pellets. Extracts were then stored at -20°C until processed for chitin measurements. Samples were thawed and subjected to two digestions with 4 μl of purified Streptomyces plicatus chitinase-63 (4 μg/ul in PBS) at 37°C for 36–40 h and then for 20–24 h. The amounts of chitin were then determined by using the modified Morgan-Elson procedure as described previously . The levels of chitin, expressed as GlcNAc concentration, were then normalized to the dry weight of the sample. Of the 84 mutants whose chitin levels differed significantly from wild type (p < 0.01 in a Student's t-test, see Additional file 2), 54 with larger changes were further considered (see text). Sensitivity to Calcofluor white was assessed using a modified version of the method described by Ram et al. . Cells were grown overnight, and then diluted to an optical density of OD600 nm = 0.5. Five μl of this suspension, as well as 1:10, 1:100, and 1:1000 dilutions of this suspension, were spotted on SD plates (buffered to pH 6.2 with 10 mM MES) containing 10 μg/ml or 50 μg/ml Calcofluor white (Fluorescent Brightener 28, Sigma), and control plates. Plates were incubated at 30°C for 48 hours, photographed, and then rechecked after 72 hours. A literature search indicated that the phenotype we found agreed with that previously reported for 29 mutants (22 interacting mutants + 7 query mutants). In 4 cases however (ARC18, PDE2, PEX6 and SPF1), we found a wild type sensitivity for mutants that had previously shown altered Calcofluor white sensitivity [22, 42, 58, 59]. These discrepancies may be due to differences in Calcofluor white concentration or to allelic or strain variation. This work was supported by Genome Canada (CB and HB), Génome Québec (HB), Genome Ontario (CB), NIH (grant RO1 A125780, CAS) and NSF (grant, IBN-0316963, CAS) We thank P. Robbins and A. Firon for their interest in this work. GL participated in the design of the study and its coordination, collected and analyzed data, and drafted the manuscript. JS carried out confirmations of SGA screens and Calcofluor white sensitivity assays. CAS carried out chitin determinations and data analysis. AMS, PM, SH and AHYT carried out SGA screens. HB and CB conceived the study, and oversaw its design and coordination. HB participated in data analysis and manuscript writing. All authors read and approved the final manuscript.